Along with posting flyers throughout the center, our team went around to client’s offices and handed them flyers as well. This made our clients feel like it was a personal invitation to the event. Needless to say, it was a great success. 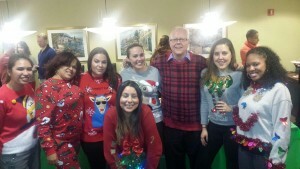 Everyone was very excited to attend and even showed up wearing their “ugly sweaters”. Many clients throughout the party approached us and thanked us for throwing such a nice event. The next day all of our clients were discussing how much fun they had. Our clients appreciated the opportunity to network with their neighbors, the catering provided by Virgo, and the fact that we were wearing Ugly Sweaters. All in all, it was a great turn out! We are all excited to plan another themed party next year!